I love beets...with a passion! I could eat them everyday...and I often do in some form. I love the quote "Forget beef...Beets! It is what's for dinner!" I think more Americans should incorporate them into their diets. In the health food store I work in, whenever we have beet salad in the case, it flies! My favorie way to eat them is simply soaked in vineger, but sometimes I like to dress them up a little more. So yesterday I was thinking that maybe they would be good with some fresh strawberries and balsamic vinegar in a salad. I was feeling creative and in a good mood, so I even cut the beets into little hearts before tossing them into the salad. I decided that I would also include some goat cheese and walnuts in the salad along with the beets, for some extra protein. It turned out marvelous, and is definately something that any beet lover will enjoy! Spring is here, and this is the perfect salad for it! In a small bowl, whisk together dressing ingredients, and set aside. In a medium bowl, combine the beets, berries, shallot, and walnuts, and toss with the dressing to coat. Divide the greens between three plates, then divide the beet mixture between the greens. Top with the crumbled goat cheese and serve! Oh Amy, this sounds so wonderful. 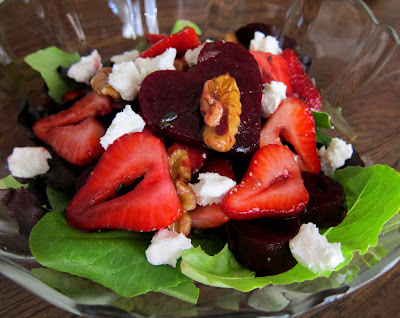 I adore beets and strawberries too-this is a really smart combination.